Whatchu Doin’? Deep Thoughts. Or Not. One super cool fellow blogger, Sabrina Garie (hey, girlfriend, HAAAAY!) 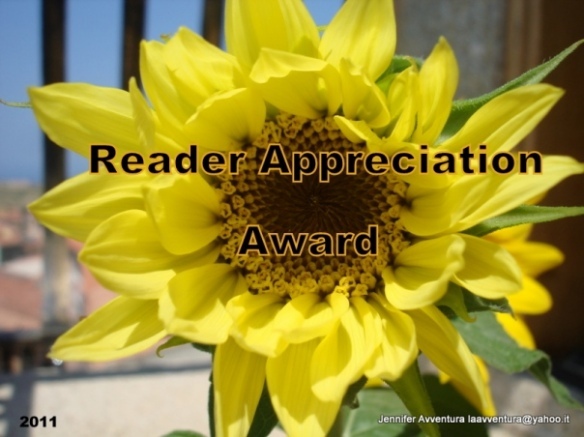 has given us the Reader Appreciation Award, which is another one of those friendly cyber accolades that make us feel all warm and fuzzy. So what I’m gonna do is tell you about my interior landscape. I just got off the phone with my dad, and he always makes me feel wonderful. I love him so much. I’m thinking right now that God made him pick up the phone and call me this particular afternoon because I needed his positive vibes…and as a reminder that we shouldn’t sweat the small stuff. And that we should count our blessings. Sometimes coincidences aren’t that. Thanks, Dad. High-five, God. Just kidding. Of course I know where they are. Now I’m wondering if I can possibly write 2,500 words tomorrow on my new romantic suspense project I’m starting. Doesn’t that sound smashing?! Kathleen has a wonderful variety of posts on her blog including recipes and such features as: People Craft– taking take of ourselves. Her latest post in this category was the guide to cleavage etiquette. So, tell me, what are y’all up to now? Misty, of course you can! I’m so glad to hear about your relationship with your Dad. I’d like to think I would have had that with my Dad if he had lived longer because we sure had a great one until he died when I was 7, almost 8. I’m pulling for you and those 2500 words tomorrow. And thanks for introducing me to Kathleen Rowland. Cleavage etiquette? I must hear more. You are so creative lady. I love your posts. Go go, go on those 2500 words. You can do it. 2500 words – I know YOU can do it. Oh, and congratulations on the award and thanks for passing along the Petals in the Gazebo Webblog – I checked it out and will keep it as one of my favorites.